In today’s competitive global markets, individuals need advanced credentials to have access to well-paying jobs. Online MBA programs afford working professionals and people with family commitments to earn a degree on their own time and at their own pace. The following schools offer some of the best MBA programs in the country, all of which are fully accredited by the Association to Advance Collegiate Schools of Business (AACSB). Online programs have the benefit of low student teacher ratios, flexibility, and access to a wide range of resources. Students have access to everything they need to succeed and can do so on their own time. Arizona State University was founded in 1885 and is a public university. Its online MBA program is described, in their own words, as focused and flexible. In addition to the general MBA, the online MBA program has a number of different concentration options, some of which include international business, marketing, and finance. Students may also pursue their MBA in conjunction with another degree such as industrial or electrical engineering (MBA/MS – Industrial Engineering or MBA/MSE – Electrical Engineering), or legal studies (MBA/Master’s in Legal Studies). It takes approximately 21-months to complete the online MBA program, and students can only take one course at a time. Each course lasts for five weeks and culminates with a final project or exam. There is also one on-campus visit requirement. Indiana University has a 51-credit hour MBA program that is taught by the same highly ranked faculty as their on-campus program. Some of the common courses, which are offered in the MBA include: business law and ethics; marketing; finance; information technology; project management; and economics. Thunderbird School of Global Management is a private, non-profit university and is one of the oldest and largest graduate schools for international business in the United States. The online Global MBA program they offer is a 45 credit hour degree, which has a strong focus on global management. Candidates must however participate in a short onsite foundation course, in the beginning of the program. The coursework focuses on global management, cross-cultural communications and negotiations, global political economy, and regional business environments. Thunderbird also offers a blended program that offers online courses in conjunction with intensive one-week regional business environment study tours abroad. It is worth mentioning that UF’s online MBA program while being 100% online does have a 2-day, on-campus requirement, every four months in order for students to take exams, give presentations, and meet faculty members. Syracuse University’s Whitman School of Management offers an online MBA program, which has been ranked no. 9 by the Financial Times. The online program is taught to the same standards as the traditional on-campus program, and is comprised of 54 credit hours of coursework. The online MBA has 3 basic components: 36 credit hours of foundational core business courses, 15 credit hours of specialized study of electives, and 3 credits of domestic or overseas residencies. Three individual residencies, each three days long, must be completed. The program also offers specialization options in areas including accounting, finance, supply chain management, marketing management, and accounting. 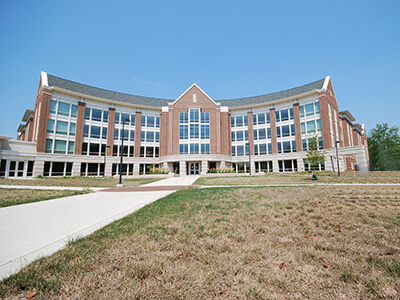 Furthermore, the student-faculty ratio for Whitman MBA courses is 11 to 1. Ball State University, founded in 1918, offers a 30-credit hour online MBA degree, which has a strong emphasis on decision-making. Of the 30-credit hours to be completed, 6 of them are designated for electives. The school has a competitive admissions process, with an average GMAT score of 533. This, along with a student to faculty ratio of 6 to 1, ensures that students can expect a program that is of a high quality. The University of Texas’ Naveen Jindal School of Management offers an online MBA program for students not able to attend on-campus classes. This degree is a total of 53-credit hours of coursework, 24 of which are to be taken as electives. The Raymond J. Harbert College of Business at Auburn University offers an online MBA program, which typically takes two and a half years to complete. In addition, students are required to do a 3-day campus visit to complete the capstone course at the end of the program. Candidates may also wish to complete a dual degree, and may do so through a Master of Science in Business Administration and Finance, Management Information Systems, and Industrial and Systems Engineering. Classes offered include: financial analysis, marketing and consumer theory, predictive modeling, advertising and promotion strategy and sales management. Marketing – This program requires 36 credit hours of coursework. Candidates can expect to learn the knowledge and skills, which are essential to marketing careers in areas like advertising or product development. Logistics management – This program requires 43 credit hours of coursework. It provides students with a foundation in logistics management. This is an essential part of supply chain management dealings with managing the flow of materials. Human resource management – This program is of 36 credit hours of coursework. It is suited for those individuals who intend to work in upper-level management positions in human resources departments. Value-driven organization – This program is of 36 credit hours of coursework. The concentration is related to the organizational values of businesses, ranging from leadership to negotiations. ERP emphasis using SAP software – This program is of 40 credit hours of coursework. This is the only online MBA program, which requires students to complete the SAP Boot Camp on campus. The University of South Dakota’s Beacom School of Business has been accredited by the AACSB ever since it was founded in 1927. The online MBA program offered by the university aims to develop socially responsible business leaders who are trained in decision making, problem solving, and understanding the role they play in business operations. The MBA is between 33 to 51-credit hours. The program has specialization options in areas, which include business analytics and health services administration. Quinnipiac University’s online MBA program is relatively new but has been highly ranked ever since its creation. The admissions are highly selective, with an average GMAT score of 540, and a 76% acceptance rate. The online MBA program follows the same structure as the on-campus program and offers students the option to specialize in one of the six areas. The program teaches students many important skills including ethical decision-making, which are crucial to interpersonal and professional development. The online MBA program also offers students the opportunity to participate in an international educational experience, which is worth three credits. The international experience has taken place in Beijing, and Hong Kong in the past. The University of Memphis’ Fogelman College of Business and Economics offers an online MBA program with a curriculum that consists of 30 core credit hours of coursework and a three-credit-hour elective course. The curriculum also includes a leadership seminar, which can be taken fully online or as part of a three-day residency held on a rotating basis at the University of Memphis campus. Students also have 24/7 access to education materials, lectures, and instruction taught by a globally-renowned facility. The University of Memphis also offers an online MBA with a Pharmacy Practice Management concentration. This is a 45-credit program for current and future pharmacists. Lehigh University’s College of Business and Economics offers a 36-credit hour online MBA program that is designed to be completed in 24-72 months. The MBA program is offered either on-campus or online, but students can choose a mix of both types of learning, if they prefer. However, all students are required to attend an on-campus orientation before the program begins. Classroom LIVE – This allows online participants to watch the class as it happens and interact with professors and fellow classmates in real time. Classroom Online – This is not live, and can be viewed at any time the student wishes. Interaction may still occur but it is done via email, online message boards and telephone calls. Students may also choose to undertake a joint master’s degree in business administration and engineering. The University of North Dakota’s College of Business & Public Administration offers an online MBA, which is of 33-34 credits, and takes at least two years to complete. The program is designed to teach students the fundamentals of advanced business functions, the impacts of internal and external factors on business management, and problem solving. Live courses are held once every week. Fundamental courses include healthcare administration, economics, corporate finance, investments, management science, real estate, sports marketing and public administration. The program is highly competitive and requires applicants to have a minimum GPA of 3.0 and a score of at least 500 on the GMAT exam. The University of North Texas online MBA program has become one of the highly ranked MBA offering schools since it was founded in 2007. The admissions are highly competitive with an average GMAT score of 516 and an acceptance rate of 55%. This, coupled with a student to teacher ratio of 4:1, has allowed them to ensure quality standards in their MBA program. Morehead State University offers an online MBA program, which allows students to either take the general business administration track or a health systems track. Course content is offered fully online, but some classes may require students to take on-campus examinations. Morehead State University’s online MBA program is a total of 30 credit hours of coursework; 24 of which are core course credits, while the remaining 6 are elective credits. The core courses have a strong focus on management and leadership and include classes such as managerial communication, financial management, leadership and ethics, and business policy and strategy. The Coles College of Business at Kennesaw State University (KSU) is one of a limited number of colleges to have earned full dual accreditation in business and accounting by AACSB International. The school provides students with the opportunity to earn an online MBA through the Georgia WebMBA program. Students enrolled in the Georgia WebMBA program are required to spend two days for an on-site orientation, which takes place in Atlanta. The rest of the program requirements are completed online through team-based learning. The online program has a strong focus on interaction and peer based education. This gives students access to networking options and services that are commonly utilized by traditional students. The online program follows the same curriculum as on-campus programs and comprises of ten classes taken over five consecutive terms. Students must register for two courses per term to complete the online program in approximately 20 months. Florida State University (FSU) offers an online MBA, which has 39 credit hours of coursework. The school offers students the opportunity to begin in fall, spring or summer terms. The program is specifically designed for working professionals who require flexibility in their course schedule and location. Most participants in the program have extensive work experience of at least five years, but some are admitted based on excellence and leadership in academic work. The curriculum focuses on globalization and technology. Core courses typically include marketing strategy in the global environment, information and technology management, and business conditions analysis. Students may also choose a concentration in real estate finance and analysis with a customized MBA that includes specialized studies on topics like real estate valuation and investments. The university also offers online students several support services, including academic coordinators who assist in developing a “degree roadmap” for each student. All the courses are delivered through the Blackboard learning management system, which includes lectures, readings, discussion forums and communication tools. Students may also have interactions with professors and collaborate with fellow students to further aide their studies. Georgia College and State University was founded in 1889 and combines with five other University Systems of Georgia to offer the Georgia WebMBA®. This program is 30-credit hours long and has 10 courses, which typically take 18-20 months to complete. Courses in this program include: Accounting, Global and International Business, Finance, Marketing, Human Behavior in Organizations, Managerial Decision Analysis, Entrepreneurship, Management Information Systems, Production/Operations Management, and Business Strategy. The University of Nebraska offers an online MBA program that is not differentiated from the one earned on-campus. This means that upon graduation, your transcripts will be the same irrespective of whether you took the degree online or on-campus. Terms for the program begin in August, October, January, March and June. Students may choose to study part-time, where six credits are completed per semester, or full-time, where nine credits are completed per semester. On average, it takes about 3 years to complete the degree. The first year of the program focuses on the fundamentals of business. Core courses include business analytics, international finance, environmental law, managerial marketing, applied organizational behavior and strategic database marketing. Business Administration MBA (57 credit hours) – This program provides students with the essential business foundation knowledge and also offers advanced curriculums and electives for the aspiring manager. Public Accounting MBA (57 credit hours) – This program is designed to meet the American Institute of Certified Public Accountants’ requirements and teaches public accounting concepts for students seeking admission to the Uniform CPA examination. Health Services Administration MBA (66 credit hours) – This program teaches health services administration foundation skills and concepts. It is an ideal choice for those seeking managerial positions in health services administration. The online MBA program at Louisiana State University-Shreveport is composed of 30-36 credit hours and can be completed in as few as 12 months. The curriculum focuses on preparing students for business careers by teaching organizational, communication skills, financial analysis techniques and marketing management concepts. Admission requirements for the program vary according to an applicant’s experience. For instance, applicants must hold a graduate degree from a regionally accredited university with a minimum 3.0 GPA; a bachelor’s degree from a regionally accredited university with a minimum 3.0 GPA; or a bachelor’s degree from a regionally accredited university with a minimum 2.5 GPA and at least three years of professional work experience. Columbus State University’s Turner College of Business offers an online MBA, which is delivered through the Georgia WebMBA program. Classes are taught by professors from different universities in this initiative. There are 10, three-credit hour courses in the program and the curriculum is comprised of courses, which focus on some of the most predominant topics of modern management including global business, human behavior and information systems. The degree can be earned fully online, with all course instruction and assessment given through online and distance means. However, students are required to attend a two-day orientation in Atlanta, prior to the starting of the program. Mississippi State University’s online MBA program operates on a flexible admissions schedule, so that students may enroll in graduate studies at the start of any semester. It generally takes 18 to 24 months to complete and requires students to pass 24 credit hours of core courses. Subjects include human resources, corporate finance, strategic marketing management, strategic business consulting, and financial and accounting report analysis. Marist College offers an online MBA that has a “virtual management focus”, guiding professionals in working with virtual organizations, electronic communications and leadership in a non-physical environment. Students are required to take six foundation courses, five core courses and five concentration courses, and the program can potentially be completed in as few as four semesters if taken full-time. Online students also have access to many of the same services at Marist College as on-campus students. This includes academic advising, tech support, the Marist Help Desk, and writing tutors from the Academic Learning Center. Washington State University Carson College of Business’ online MBA is a relatively new program and is very selective. Applicants are required to have an average GMAT score of 567. Suffolk University’s Sawyer School of Management offers an online MBA program, which features an interactive online format that allows students to get the full experience of the on-campus program. The MBA curriculum is comprised of 21 credit hours of coursework and those students who select a concentration must complete an additional 12 credits in their specialization. The online environment of the MBA program is highly interactive. It has videos, slideshows, and multimedia presentations. Students are also able to live chat with their professors and participate in discussions with their peers in online discussion boards. The University of Tennessee Martin’s online MBA offers a unique program that keeps its student body small. Generally, 20 students are grouped together for the 20-month program. The benefit of a low student-faculty ratio of 5 to 1 is that it further ensures individual attention. This program is one of the most highly selective online MBA programs with an acceptance rate of only 42%. There are no specializations offered in the University of Tennessee’s MBA, but the program is noted for its focus on the financial services and banking industries. Today, many professionals cannot afford to quit their jobs and join a school to acquire further credentials. Online MBA programs offer the ease and flexibility to manage one’s own time and study at the time of convenience. This allows the students to enhance their qualifications with the hope of having better job prospects and higher earning potentials upon graduation.